As retailers prepare for the holiday season in a rapidly changing environment, Retail TouchPoints, the industry’s go-to source for customer engagement strategies, unveils Taking The Pulse Of Store Operations, an in-depth look at today’s most significant challenges facing store operators. said Debbie Hauss, Editor-in-Chief of Retail TouchPoints. As retailers prepare for the holiday season in a rapidly changing environment, Retail TouchPoints, the industry’s go-to source for customer engagement strategies unveils Taking The Pulse Of Store Operations, an in-depth look at today’s most significant challenges facing store operators. 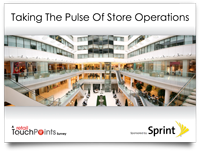 In its inaugural Store Operations survey, Retail TouchPoints determined that retailers are getting smarter about their store operations investments. A significant number of retailers are increasing their investment in Mobile Technology (36.7%), Product Merchandising (36.7%), and Employee Training (34.7%), although their overall store operations are decreasing in many cases (46.9%). to implement an employee training and retention program in the near future, 22.0% have no plans to implement. they have increased budgets for Mobile Technology (36.7%), Product Merchandising (36.7%) and Employee Training (34.7%), a large majority note a decrease in the Overall Store Operations Budget (46.9%) for 2012.
devices for store associates also helps with employee retention, with 51.2% of respondents stating that it Improved Employee Morale. devices, consumers are not only comparing competitors’ prices, but they also are looking at a specific item price from one channel to another. Different pricing online versus in-store is confusing for consumers and may drive them to abandon the purchase and the brand altogether. More than half (56.1%) of survey respondents reported that they offer consistent pricing across all channels; 26.8% noted that they offer consistent pricing across some channels; and 2.4% are planning to implement. Still, 14.6% of retailers surveyed still do not offer or plan to offer consistent pricing across channels. There’s much more in the full report, which is sponsored by Sprint. For a complete view, please click here, or contact Debbie Hauss, at Debbie(at)retailtouchpoints(dot)com, for interview opportunities. If you are aware of retail store operations executives who deserve accolades for their accomplishments, click here to nominate them for a Retail TouchPoints Store Operations Superstar award. For an in-depth look at retailers’ 2012 holiday strategies, click here to download the Retail TouchPoints Holiday Outlook Guide. Retail TouchPoints is an online publishing network for retail executives, with content focused on optimizing the customer experience across all channels. The Retail TouchPoints network is comprised of a weekly newsletter, category-specific blogs, special reports, web seminars, exclusive benchmark research, and a content- rich web site featuring daily news updates and multi-media interviews at http://www.retailtouchpoints.com. The Retail TouchPoints team also interacts with social media communities via Facebook, Twitter and LinkedIn. more than 56 million customers at the end of the first quarter of 2012 and is widely recognized for developing, engineering and deploying innovative technologies, including the first wireless 4G service from a national carrier in the United States; offering industry- leading mobile data services, leading prepaid brands including Virgin Mobile USA, Boost Mobile, and Assurance Wireless; instant national and international push-to-talk capabilities; and a global Tier 1 Internet backbone. Newsweek ranked Sprint No. 3 in its 2011 Green Rankings, listing it as one of the nation’s greenest companies, the highest of any telecommunications company. You can learn more and visit Sprint at http://www.sprint.com or http://www.facebook.com/sprint and http://www.twitter.com/sprint.